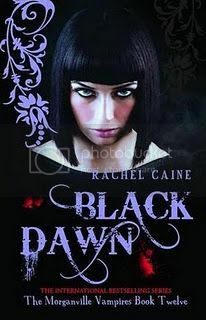 Black Dawn by Rachel Caine (review copy) - WARNING! I cannot review this book without spoiling the others in the series. Read no further if you're planning on reading this series and don't want it spoiled for you. When a tide of ferocious draug, the vampire's deadliest enemy, floods Morganville, its eclectic mix of residents must fight to save their town from devastation. Chaos has taken over the quiet college town of Morganville as the threat of the draug rapidly spreads with the help of the city's water system. Whilst most of the locals have already fled, student Claire Danvers and her friends Shane, Eve and Michael choose to stay and fight. You all probably know by now my huge love of The Morganville Vampires Series. I have been in love with this world and these characters since book one, where each book left me desperate for more. Considering how amazing I already thought this series was, you'll know have some idea just how good Black Dawn is by me saying this is the best book in the series so far! I have said many times that Rachel Caine is a genius, but she steps it up a notch in Black Dawn. The action in this book is relentless! Seriously, it doesn't stop! Now, readers of The Morganville Vampires series might be thinking that every book is action packed, and you would be right. But the difference with Black Dawn is that the whole novel spans two days. Two days! Previous books in the series span several days, and though action packed, within the time that goes by in the story, it could be a day or two between the big, exciting action scenes. With Black Dawn, it's a matter of hours. Sometimes minutes. Because of this, and the horrendous draug, Black Dawn comes close to being what I would consider a mild horror. I was seriously freaked out pretty much all the way through. It is literally a battle against time, because the draug will stop at nothing to get what they want - the vampires, and then the town. With no idea how to stop the draug that can seemingly appear out of nowhere, but needing to try, our awesome characters - and us as readers - are at our wits end. The synopsis above says that the future looks bleak, and it's spot on. How do you kill that which has never been killed before? Death looks inevitable, but those who are left in Morganville won't go down without a fight. With this in mind, Black Dawn is really the most demoralising book in the series, and the constant rain that brought the draug to Morganville doesn't help matters. The mood is of general dejection, but our four main characters have issues of their own. At the end of Last Breath, after being rescued from the draug, due to extreme weakness and hunger, Michael attacked Eve without thinking. He could have killed her. So those two have some major, major issues to sort out - if they can. I have never seen seen Eve or Michael as despondent as they are in this book. Claire and Shane also have problems of their own; after a mission goes terribly wrong, Shane is left haunted psychologically, and has problems disentangling dreams from reality. He is confused and desperately scared of his own mind and at times can barely function. He is completely lost, and Claire doesn't know how to bring him back. It's devastating to watch. Although it's fiction, we've had eleven books to get to know and love these characters, and we now know these people inside out. To see Shane, the tough, sarcastic, funny guy to fall apart and lose his grip like he does, it's so unbelievably upsetting, and like Claire, you're desperate for him to find a way back. Black Dawn is told through multiple perspectives, as Last Breath was, but with more people narrating the story than you would expect - some of the narrators being characters you'd least expect. But it's absolutely necessary. Not everyone can be together at the same time when things are as bad as they are, so when people split up, to know what's going on where, we follow different characters. It's also massively important because there are so many people going through major emotional turmoil, and it shows us exactly what's going on in their heads. Claire is still the main narrator (in third person, while everyone else's is in first), but it is amazing to have all these other points of view too. In some cases, it's brilliant, because we get to see the intentions of surprising people, long before anyone else is clued in to what's happening. Trouble is coming. Black Dawn is just brilliant, and scary. Things have changed massively, for everyone. Morganville will no longer be as it has been, people have changed, life is more difficult - and not everyone will make it out alive. Black Dawn is a pivotal book in the series, and it's absolutely fantastic! I am so excited to read the thirteenth book in the series, Bitter Blood, which is out in November. This series just gets better and better - I don't know how Rachel Caine does it. Bitter Blood is going to be so, so excellent.